Holotype male specimen of L. zeppelini: (A) dorsal view, (B) lateral view, (C) lamina circularis on pectoral-fin, (D) medial view of pectoral-fin removed from paratype showing lamina circularis. zeppelini: named for the rock band Led Zeppelin because the diagnostic double lamina circularis of this species reminded the authors of the Gibson EDS-1275 double-neck guitar used by Jimmy Page. Known from the middle and lower Mekong river system in Thailand and Vietnam, plus the Chao Phraya drainage in central Thailand. Type locality is ‘Mun River, tributary of Mekong River, Ubon Rajathanee University campus, 15°08’03.18″N, 104°55’27.78″E, Ubon Ratchathani, Thailand’. Small streams, marshes and flooded rice paddies were also sampled but only one juvenile was collected from a sandy stream. The majority of congeners tend to inhabit shallow, slow-moving sections of streams or calm habitats such as swamps, oxbows, backwaters and paddy fields. These are often heavily-vegetated or littered with submerged roots, branches and leaf litter, with substrates composed of soft mud or silt. Water clarity and depth vary on a seasonal basis across much of its range, and at certain times of year it probably enters temporarily-flooded zones. Conversely during dry periods some habitats may become stagnant with blooms of macrophytic algae and resultant hypoxia (oxygen depletion). Under such conditions members of this genus are able to use the intestine as a supplementary breathing organ and have been observed darting to the surface to gulp atmospheric air, and some have even been recorded to survive dry periods in moist sand or mud. The largest specimen known measured 25.8 mm. Should not prove difficult to keep but must be provided with a soft, sandy substrate since some of its time will be spent completely buried, or with only eyes protruding. When coarser gravel is used it may become stressed or damage itself trying to dig, and feeding behaviour can be inhibited. Other décor can include water-worn rocks and driftwood branches and tree roots arranged to form plenty of hiding places and shaded spots – add these prior to the substrate to prevent them being toppled by digging activity. Lighting can be quite dim unless you intend to grow plants and a few handfuls of leaf litter would complement the natural effect. As this species hails from sluggish waters high flow rates are best avoided although a degree of oxygenation is recommended. Ensure that small specimens are unable to enter filter intakes and cover the tank well as most loaches do jump at times, especially when first introduced. Probably a micropredator sifting mouthfuls of substrate through the gills from which insect larvae, small crustaceans and suchlike are extracted. In the aquarium it should accept sinking dried foods but should also be offered regular meals of small live and frozen fare such as Daphnia, Artemia, bloodworm, etc. 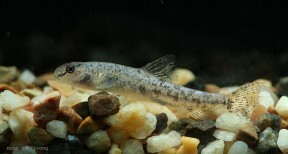 L. irrorata should do well alongside fishes from similar environments that occupy the upper part of the water column such as Trichopodus, Trichogaster, Trichopsis or certain Danio species. The presence of these should also make it less timid as the absence of fishes in the upper water column is often used as a signifier for approaching danger in nature. Sand-dwelling loaches from the families Botiidae, Cobitidae and Nemacheilidae are also suitable but proper research is essential as some can be excessively territorial or otherwise aggressive. In mature males the pectoral fins are enlarged with fused, thickened innermost (7th and 8th) rays forming a structure known as the lamina circularis, which in this case forms a large, dorsally projecting, rounded rectangular flange with approximately 25 fine serrations plus a smaller, ventrally rounded flange. Males also have larger pectoral and pelvic fins plus a significantly smaller adult size with an average SL of 18.1 mm and maximum 21.7 mm vs. an average of 19.9 mm and maximum 25.8 mm SL in females. There are also differences in colour pattern, with adult females tending to possess spots on the flanks and males a narrow, dark lateral stripe. This species is not traded often but may occasionally be exported as bycatch among shipments of other species. It can be distinguished from congeners by the following combination of characters: lamina circularis in mature males located on 7th and 8th pectoral-fin rays and forming a large, dorsally projecting, rounded rectangular flange with approximately 25 fine serrations plus a smaller, ventrally rounded flange; caudal-fin forked; barbels small, not reaching orbit; presence of dark reticulations on caudal-fin; small adult size (to 25.8 mm SL). 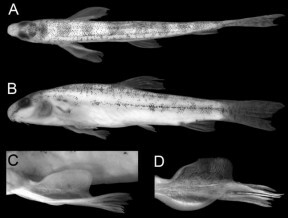 A new species of Lepidocephalichthys (Teleostei: Cobitidae) with distinctive sexual dimorphism and comments on relationships in southern lineages of Cobitidae. Now THAT’S a funny-looking loach. I thought it was a tetra at first glance.